Wizzie glamour shot! Day 3? My chipmunk cheeks are NOT cute. I have had the privilege of being a patient on a few occasions, some less serious (Bells Palsy, Pityriasis Rosea) and some more serious (Transverse Myelitis). I'm fortunate to be pretty healthy overall and try to steer clear of trouble. I do go to my GP who is an amazing full-scope, old-school, dedicated doc. Even though I think he's amazing, I still say "no" sometimes. Most recently he suggested some screening blood work, and I declined. He gave me the requisition anyway, but needless to say I did not donate any blood to the cause. With that said, it will come as no surprise that I never wanted my wisdom teeth out. Healthy Debate has a timely article, Is wisdom teeth removal really warranted?, covering all the evidence and the information one needs to make a decision about whether to get impacted teeth extracted. My wizzies (that's what cool kids call wisdom teeth) were sitting in my mouth, just being teeth, maybe impacted but not really causing any trouble. Until... they started to peek out in my 20s, and now age 30, one of them (right, lower wisdom baddie) created an unreachable space between him and his neighbour molar. Boom! Infection. Periocoronitis. Yuck. I did all the conservative stuff and tried to keep baddie's space clean and happy but no matter the fancy syringe or amount of peroxide I blasted in there, the infection continued, slowly smouldering. My dentist suggested I see the oral surgeon. He also suggested a bunch of other things, like braces, which I said no to. While I am fortunate enough to have a great dental plan, I did not want the headaches and hassle of that just for cosmetic reasons and the chance that it would slightly improve the way my teeth were wearing. Dr Dentist listened to me and agreed. That was nice! The alternative of leaving my wisdom teeth in would be possible, but the infection would wax and wane and it could do this when I'm out of the country or could require repeated courses of antibiotics, visits to the dentist, etc. So I agreed to go see the oral surgeon (Dr Surgeon) who said all my teeth definitely needed to come out. Oh, and I'd need a CT scan first to see if the tooth roots were wrapped around the inferior alveolar nerve. Dr Surgeon was awesome at discussing the risks. He also offered an alternate plan if the teeth were intertwined with the nerve. The CT really wasn't optional, as it was needed for planning the technique. I asked if I could just get baddie out, but he suggested it was better to do all of them at once so I wouldn't have to go through the surgery later in life if there were more issues. Getting wisdom teeth out after 25 is not ideal to begin with, and doing it on 4 separate occasions (if needed) would indeed be torture. Now, my jaw is recovering from having a crowbar go exploring in it. Well, actually I'm sure Dr Surgeon was as gentle as possible but they were stuck in there pretty well. My right side (where the infection had been) healed very well, the left basically did the maximum amount of swelling/trismus possible and I even got a shiner. Round the clock ibuprofen, lots of ice, etc. was somewhat helpful but mostly it just took time to settle. Compared to others who've had the same surgery, I got off easy. My inferior alveolar nerves were fine. I didn't get a nasty infection like my brother did when there was a perforation into his sinus(!). I didn't die from complications of the anaesthesia. Phewf! Every time I am a patient, I learn things about myself and especially about doctoring. - I hardly ever had to wait in the clinic, everything was basically on-time which was incredible! 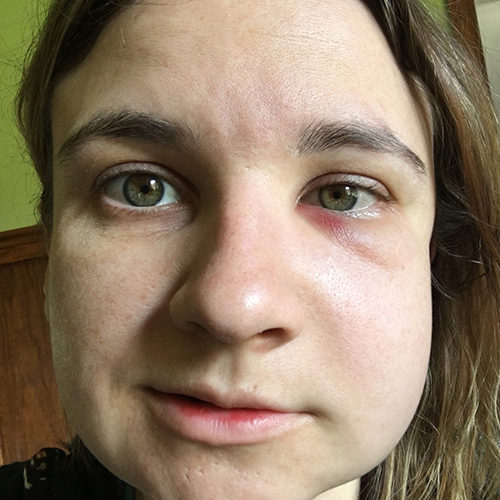 - one side of my jaw was not bad and the other with terribly terribly painful, which made me wonder if some complication was happening, it would have been helpful to know that this is "common"
- I was given a prescription for antibiotics; this was not mentioned in the handout or by the surgeon to my spouse so I was unsure if I should take them or if they were a delayed prescription (eg. take if a complication arises); when the clinic called to check on me the day after surgery I asked the caller whether I should take the antibiotics. She said "yes, of course." And I tried to clarify, "oh, I wasn't sure if everyone takes these or if they were just if some complication developed; I didn't want to take them without being sure because of the risks of antibiotics" and she told me "there aren't any risks." - the handout was great but I wish I would have received a copy before the day of the surgery; one of my values as a patient is "eating popcorn" and I was a bit sad to find out on the operation day that I would not be allowed popcorn for 3 months!!!!!!!! In the end, did I get the right amount of medicine? Maybe. I'm not sure! In hindsight, I would certainly have asked a few more questions (eg. about antibiotics) and I might have opted for removal of just the one baddie wisdom tooth. Overall it was very challenging being a patient with a background in health care. When I went numb from the waist down two years ago, I basically dismissed it for three days before my dad (a nurse) insisted I seek attention - and there turned out to be an inflammatory lesion on my spinal cord ('transverse myelitis'). So now, I try really hard to mention things that seem odd or wrong and let other doctors decide if they are important. The consequence of that is that I probably come off as a worrier, but I'm sure I'll find a balance with more adventures as a patient. I just hope this is all the medical adventuring I'll have for a little while, at least.